Once upon a time I walked into a store and saw a cute skirt that I really liked. Knowing that I didn’t need it, I put it back on the rack and walked out the store. Clearly at some point afterwards I got weak. As you can see I went back and bought the skirt. Judge me all you want, I cares not (insert slight eye roll)! In Instagram life, I stay in a bang’n outfit, yet in real life not so much. As a matter of fact, here recently my work attire has consisted primarily of plain tops, a pair of jeans or casual pants. However you will most likely find my footwork on point. The only reason you might catch me “dressed up” for work is if I have a meeting with big wigs in attendance or for a presentation of some sort. Speaking of presentation, last week my manager volunteered me to represent our department at some big process meeting. Which meant I had to stunt on them with a awesomely cute business casual look. While I didn’t wear this look, I could have. Today’s work wear inspiration is simple, comfortable and stylish. 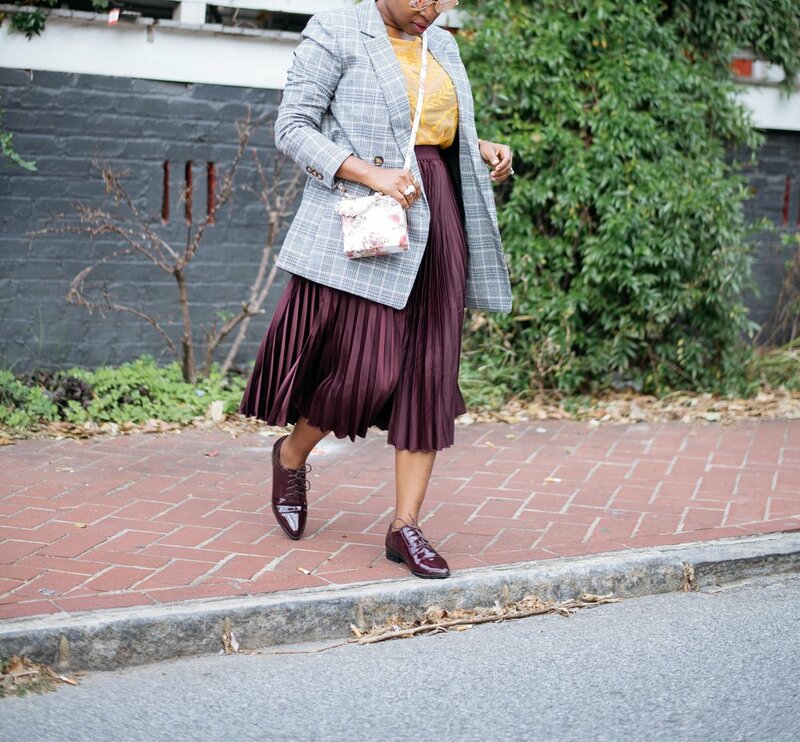 I love the rich plum color of this midi skirt and it paired perfectly with this glen plaid blazer. For a bit of excitement, I opted for this mustard top (which is actually a dress - look here) for a pop of color. Although business casual indicates an office appropriate attire you can still have a little fun with it. A mix of tailored and/or traditional pieces with more fashion-forward items are the way to go. Just because your office has a dress code, doesn’t mean you can’t get a little creative with your work outfit. Depending on the amount of wiggle room within your company’s dress code policy you might be able to get away with subtle prints or colors like in today’s look. A bomb blazer is always a good go-to option. Don’t down play making a statement with your accessories (i.e. earrings, necklace, bracelet or ring). 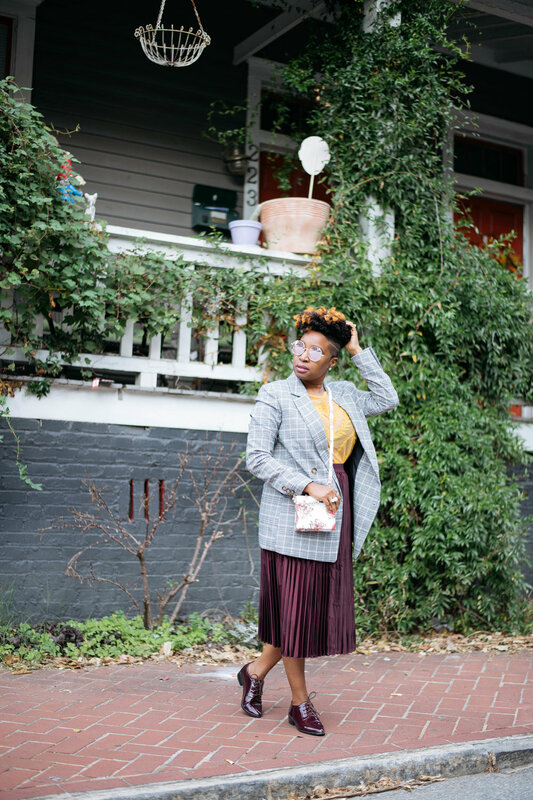 If you’re not fond of the idea of wearing heels all day, a bold colored flat, a pair of mules with a dope print (and dare I say it - a kitten heel) works just as well. Consider adding a bright color just for the heck of it. 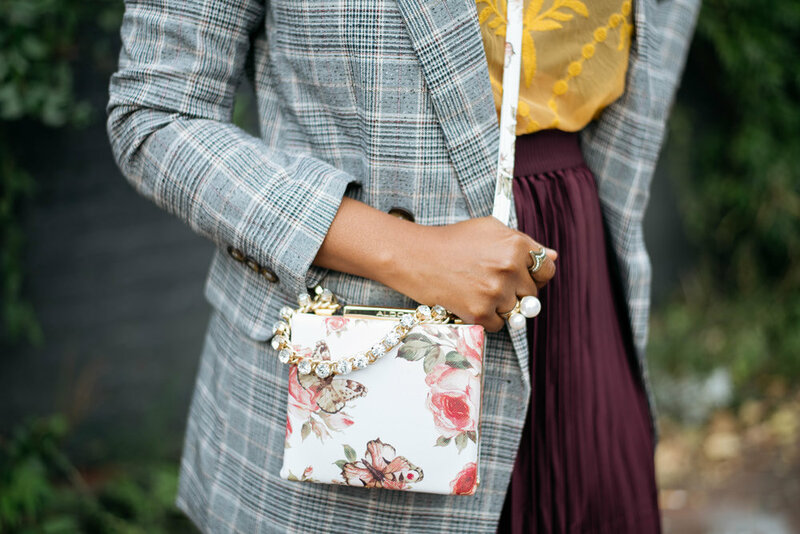 Remember dressing for work doesn’t have to be boring!